In case we need further proof that drivers and cars will continue to receive priority over every other mode of transit in San Diego, the San Diego Police Department has provided more clear evidence of the supremacy of the car, this time at the specific expense of pedestrians. If there is a single clearly beneficial manner of transit we should be encouraging at every chance it is walking. Following jaywalking stings in recent years, now the police department is going out of its way to portray pedestrians as dangers to the community and themselves and explaining some steps pedestrians should take to further cater to cars and avoid inconveniencing motorists. This comes at the same time as we continue to widen roads, raise speed limits, and remove painted crosswalks (recently at the busy and popular corner of 30th and Upas in North Park). Additionally, both the city and county continue to espouse policies regarding crosswalks that explicitly argue against installation of painted crosswalks due to the ‘false sense of safety’ that they provide to pedestrians. The animosity towards pedestrians would be laughable if it wasn’t so tragically dangerous. Am I overstating the case? Pedestrians deaths across the city continue to roll in, although whenever possible they are painted as scofflaw jaywalkers that were essentially asking for it by breaking such a serious law. A law, by the way, that is another clear signal that cars dominate our priorities. On a street like the one I live on, the block is 330 feet long and 53 feet across. Jaywalking ensures that this entire space is illegal for pedestrians to use in any manner and is reserved solely for vehicles. Policies against painted crosswalks at both the city and county levels further enhance the allocation of space to vehicles by not even marking out an inch for pedestrians. and non-painted are different kinds of crosswalks. As a result, motorists will ignore pedestrians waiting to cross the road and fail to yield as required by state law. Given that an elementary school is one block from the unpainted intersections on my street it would seem obvious that painted crosswalks should be present. If we can’t provide even the most basic type of pedestrian facilities for small children who will we provide them for? This will remain unlikely as long as the county and city maintain their stance that painting crosswalks actually increases the danger to pedestrians. Even if they painted crosswalks at both ends of a block like mine and made them 10 feet wide, the amount of space legally usable for pedestrians would be 6.06% (1,060 square feet / 17,490 square feet). The majority of the road, 93.94% would be reserved solely for the passage and storage of vehicles. Enough anecdotes about the incredible amount of land we dedicate to vehicles only, which is a constant and physical reminder of what we place value on. On to the seemingly well-intentioned note from the SDPD to help keep pedestrians safe which is shown in full below. What are we keeping pedestrians safe from? Other pedestrians? I don’t recall the last pedestrian killed by another person walking. Of course the danger that is obliquely referred to is the motor vehicle. For some reason the onus is put on the pedestrian – the most vulnerable and least detrimental form of transport known to humankind. 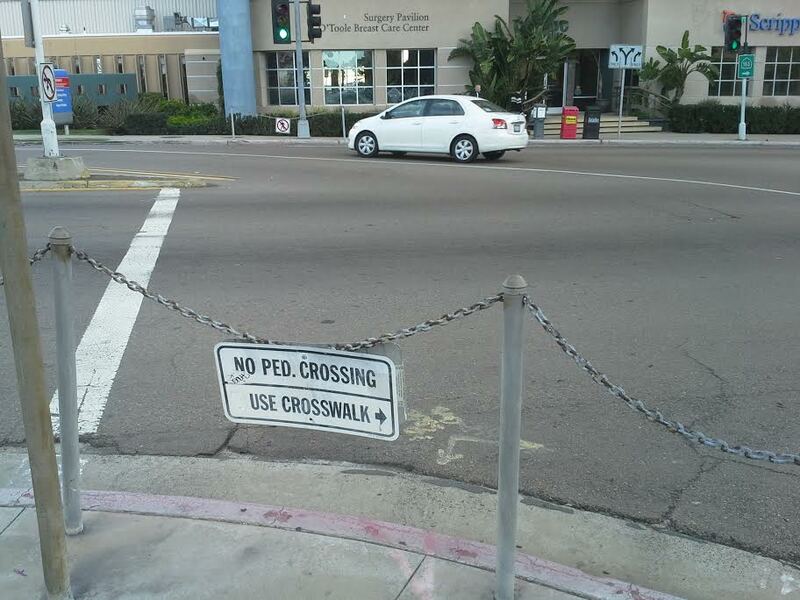 So what advice does the SDPD have for pedestrians to keep themselves out of harms way? Essentially to dress like a traffic cone and give vehicles priority whenever possible; this is also known as ‘defensive walking’. Pedestrians should dress in bright colors, carry a flashlight, look thrice before crossing the street and do so only at corners. Again, no one is being killed or injured by pedestrians. Our neighbors and friends are being maimed and killed by motorists every single day of the year. Pedestrians are not the problem, they are a key part of making where we live safer and more enjoyable. If we were serious about keeping our neighborhoods safe for pedestrians we would take effective action against the biggest danger, motorists, and not penalize and scare people that might otherwise walk. Lower speed limits would be a great start. Another powerful tool would be penalizing drivers that kill people. Running over an old man crossing the street in an unmarked crosswalk should not be chalked up to ‘oops, my bad’. Running over an elderly woman walking on the sidewalk should not result in no ticket. These are real tragedies happening right where we live. The same police department that is scolding pedestrians for their flippant and unsafe ways is letting motorists walk away from a dead body without even a basic traffic citation. There is no clearer example of how much we will prioritize the car over all, we don’t even take killing someone seriously when it is done with a car. Will the SDPD be posting safety tips for motorists to Nextdoor as well? I won’t be holding my breath but hope so. I would suggest posting safety tips for each mode of transport in proportion to the amount of people killed by that mode in the past year. Obviously this would result in an incredibly high amount of safety tips for motorists as compared to pedestrians, bicyclists, and bus riders. This would be appropriate because motorists are the biggest danger by a very, very wide margin to others. The safety tips below are like addressing secondhand smoking by advising non-smokers to wear masks, avoid areas where smokers may be, and at the same time granting the majority of public land to smokers. It’s farcical and yet, in regards to transport, it is exactly what we are doing over and over in nearly every facet of our society. It’s time to stop stigmatizing safe transport and giving dangerous transport a free pass. Motorists are dangerous, pedestrians are not. Crossing Harbor Drive adjacent to the new Waterfront Park in Downtown. Note the many curbs to cross. No crossing this side, go over on-ramp, then proceed over curbs. Completely non-ADA compliant. • Always look left, right, and left again before crossing a street and keep watching as you cross. Be aware that drivers have differing levels of eyesight and skill in operating motor vehicles. • Make sure you are seen: Make eye contact with drivers when crossing busy streets, wear bright colors or reflective clothing if you are walking near traffic at night, carry a flashlight when walking in the dark. • Walk defensively and be ready for unexpected events. Know what is going on around you and don’t allow your vision to be blocked by clothing, hats or items you are carrying. • Watch the pedestrian signals, not the traffic signal and follow the “walk/don’t walk” lights. I’m reminded of the NRA’s First Principle: guns don’t kill people, people do. When cars do it we learn that pedestrians commit suicide. While I completely agree that “oops my bad” should not ever be an excuse and killing or injuring a pedestrian should carry a very stiff penalty (unless the pedestrian just jumped out of nowhere), the reality is it’s a good idea to never make the assumptions a car will stop. That’s just common sense. All drivers are pedestrians at other times. Even at a crosswalk when signaling for me to walk I still look both ways. Goatskull – I agree, common sense and practice make looking both ways a good idea whether walking, driving, or doing anything else on the streets. I was referring to no cars in any direction not as in close proximity but even 2-3 blocks away. As I often encounter crossing 30th Street there is a constant low flow of auto traffic and since motorists are not reminded to yield to pedestrians or penalized for failing to do so pedestrians are stuck on the corner. I’ve watched elderly women in the heat pushing small shopping cars get passed by 20 or more vehicles. My own personal experience pushing a double stroller is similar – crosswalk or no motorists will generally not yield to pedestrians. As a result, unless it’s an ‘all clear’ situation it’s hard to cross even a moderately busy, low speed street. In Pacific Beach most local drivers are very courteous and share a hand sign, and a smile, when we meet at intersections with pedestrians and bicyclists… Hopefully the domineering ways of of some tourists from other “big car states “do not become the norm around here! Don’t assume that a motorist is NOT from another state where cars rule, and they don’t have to stop for pedestrians. I’ve long felt that any block that has a school with kids who are (pre-)K through grade 12 should have, at every corner, 4 way stops or traffic lights. This reality is especially visible in downtown SD, where I have lived for almost 20 years. The police down here are basically sheep herders, moving pedestrians from one grub & grog joint to another. If one or two are lost along the way, chalk it up to the cost of doing business. Meanwhile tickets are issued for public drunkenness & disorderly conduct, putting the sheep into a slaughter pen until they pay. While carousing or in custody, their paid parking expires, making both cars & pedestrians revenue producers. San Diego’s favorite meaning for acronym SD is “Sin Delivers.” But the money is nowhere visible on streets looking like a bombed out no-man’s land. Hard on both cars & people, but way worse for walkers who have to navigate a mine field of potholes, cracks, & cars trying to avoid the same. There is NO accessible north/south crosswalk at 30th and Upas. Jack in the Box underwent a major reconstruction but didn’t bother with the crosswalk (as we all know, it survives on its drive-thru.) University Ave also has major problems. I’ve filed complaints with the city for years and they just ignore it. Cheaper to settle lawsuits with taxpayer City attorneys than to fix the problems. Off topic but I’m surprised that JITB even survives. Not because of the politics involved with the re-construction but just the fact there are so many food options in that corner now. Thanks for writing this John. I feel your frustration and agree with your points. The lack of safety for pedestrian in this City has reached a crisis point. More and more are being killed and injured each day. To its credit, the City is taking slow steps towards improvement, but I agree it’s not fast enough. The best thing anyone can do who reads this is to contact their councilmember and tell them they support safer, more walkable bikeable streets. They need to hear from us.